Warm fall morning, Sweet Gum shows through the Ginko. Perfect fall day in Palo Alto, warm and sunny after a light sprinkle of rain. Our little ginko is turning yellow and will soon drop its leaves. The neighbor’s Sweet Gum (liquid amber) is brilliant this year. Quilters know how to pick up these fall colors. The quilt below shows this. 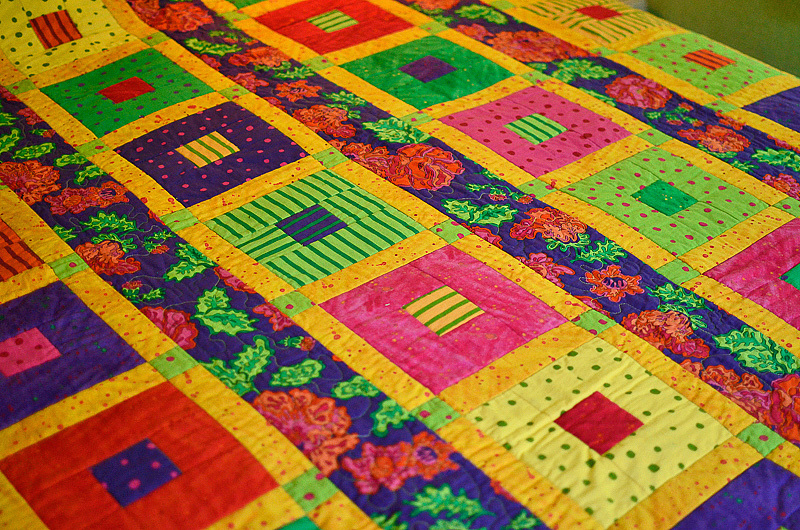 Celebrate, Cotton quilt with fall colors. Quilter, Joanne Nolt; Fabric design by, Yvonne Porcella. 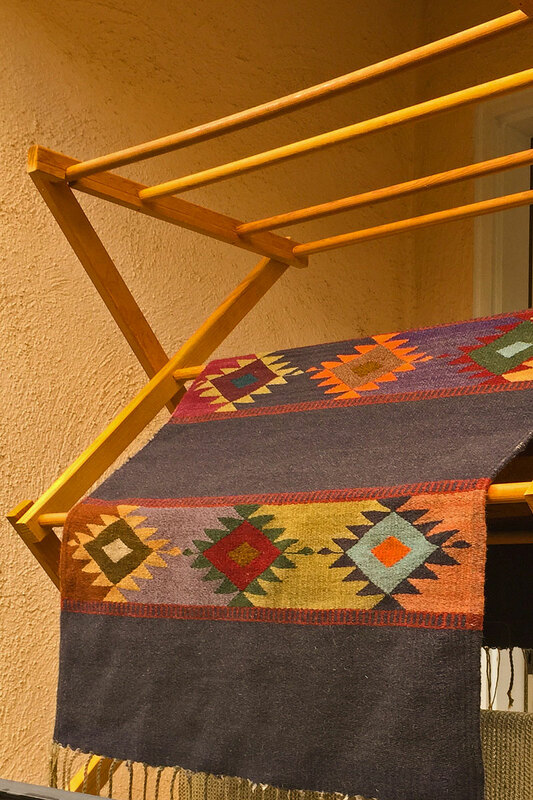 This small Zapotec rug is drying on the porch. I love the color and design. 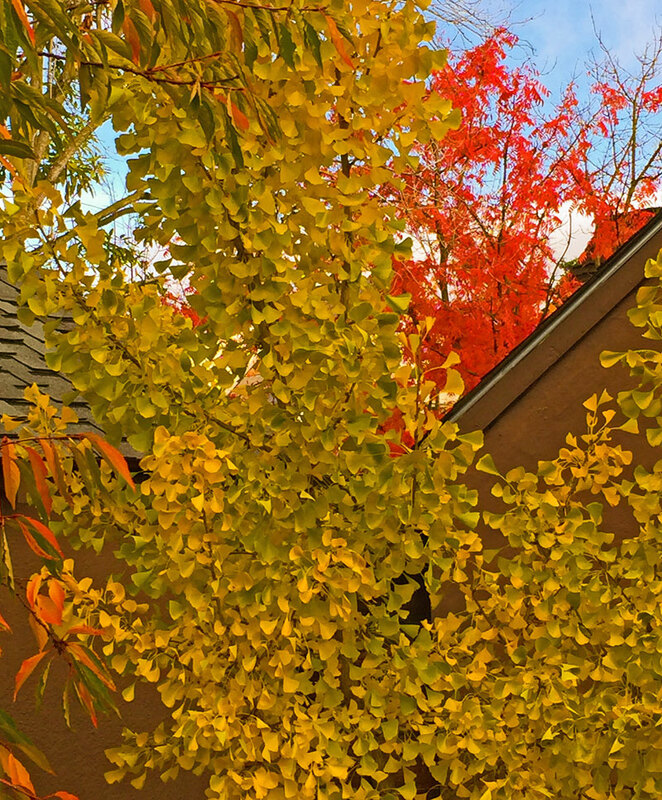 Three ways to look at warm colors. This entry was posted in Wordpress and tagged blogging101, Joanne Nolt, photo101, Photography, Quilts, Zapotec by carto. Bookmark the permalink. Striking colors. Wonderful for the west coast where it never gets cold enough to cause the dramatic change of colors as it does in New England. I’m a visitor to the White Mountains. Lovely all year, but foliage season is truly spectacular. Yes, I lived for many years in central NY and it was wonderful to see the colors but a bit sad to know that it meant coming of almost 6 months of winter. I live north of SF and miss the wild colors. Thanks for your comments. Wonderful colours. I have been to Oaxaca and seen them making these rugs! Such a beautiful country and people. I hope to visit Palo Alto one day. I bought the rug in Tule near Oaxaca and close to the weaving village. Their weaving is beautifully done.